500 + fresh, foolproof recipes from across the region, with an invaluable shopping guide so you can master the world's healthiest food at home. 500 Vibrant, Kitchen-Tested Recipes for Living and Eating Well Every Day. Bring the Mediterranean—from Italy and Greece, to Morocco and Egypt, to Turkey and Lebanon—into your kitchen with 500+ fresh, flavorful recipes. This comprehensive cookbook translates the famously healthy Mediterranean diet for home cooks with a wide range of creative recipes, many fast enough to be made on a weeknight, using ingredients available at your local supermarket. There isn’t a single “diet” that encompasses the entire Mediterranean region—spice-laden dishes of Morocco bear little resemblance to the lemon- and caper-laced cuisine of southern Italy. Rather, Mediterranean cooking is about what these cuisines have in common: a daily emphasis on vegetables and fruits, beans and lentils, whole grains, more seafood than meat and poultry, and heart-healthy olive oil. Fresh, high-quality ingredients and simple preparation techniques let the extraordinary flavors shine. 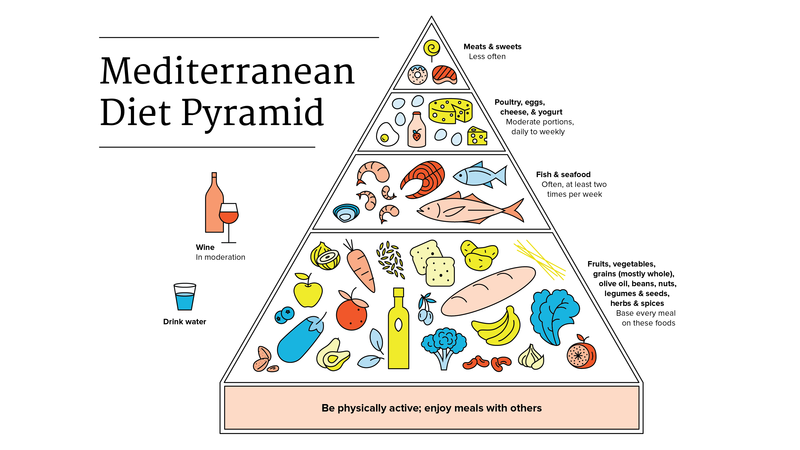 The Mediterranean diet pyramid, developed in the 1990s, paved the way for the diet’s popularity here in the United States, and we used it as a guideline to organize the book.